New Sour Patch Kids Berries soft and chewy candy from Cadbury-Adams. These delicious candies come in assorted colors and flavors and are coated with sour sugar. 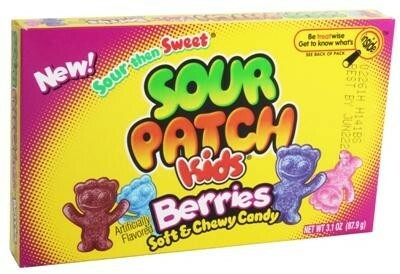 Sour Patch Kids Berries are cute, sweet candies that are "sour then sweet." These candies are fun to eat for kids of all ages and come in four berry flavors.